and as a root out of a dry ground. nor appearance that we should desire him. for the transgression of my people he was struck. and the good pleasure of the Lord shall prosper in his hand. 11 He shall see of the anguish of his soul and be satisfied. Today we begin the Lenten journey to Jesus’ death on the cross and to His resurrection from the dead. Tonight for Ash Wednesday we are introduced to our Guide: The Good Shepherd (John 10:1-18). Those words are often spoken by the pastor as he applies the ashes to the forehead. So there is Biblical support for Ash Wednesday practice, but there is no requirement that is must be done. 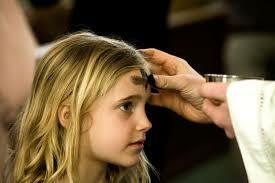 The marking of the forehead is not a “sign of spirituality” for the person receiving the ashes for others to see. Rather, it reflects the person’s acknowledgment of sin and its affect on the person. Ashes in the form of a cross also remind the person that Jesus fulfilled the demands of the Law for living and satisfies the demand of death for sinning. The cross of ashes then reminds us of the great debt of sin and the greater payment of that debt by Jesus. This coming Sunday is the 5th Sunday after the Epiphany, according to the Three year series. Here is the Old Testament reading. These are just preliminary thoughts about how to approach the text. Isaiah speaks to a people who have become downcast, discouraged, and from their perspective all seems lost, no evidence that God is in control. Thus, we find the refrain: “Don’t you know? 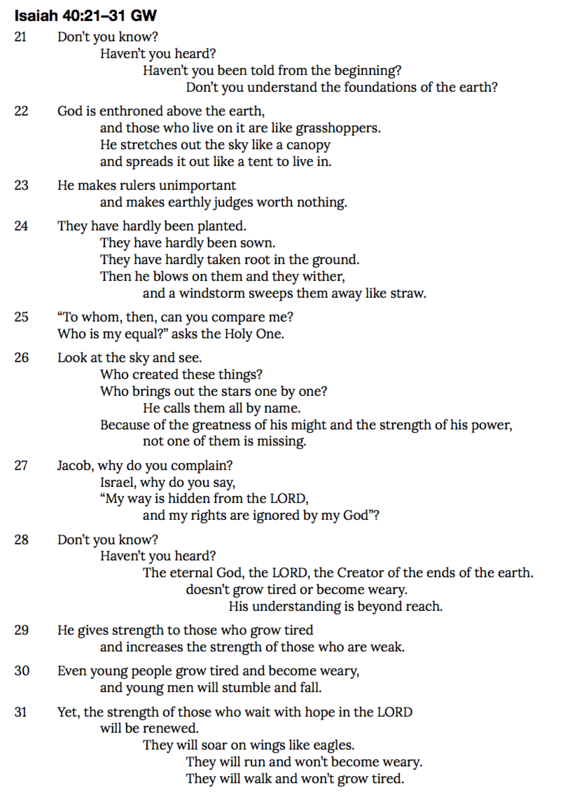 Haven’t you heard?” (v. 21 and v. 28). and increases the strength of those who are weak. and young men will stumble and fall. When Jesus Christ fulfills all things, it includes these promises of God. If you are tired, then God strengthens you, sometimes in surprising ways, sometimes unseen. This who wait with hope in the Lord—they will be renewed. May this comfort, encourage, and strengthen as we live in this time.